Thursdays, 3:00-7:30. May 30 - October 10, 2019. At Queen Anne Farmers Market, we have partnered with local artists who created gorgeous yearly, collectible posters that we sell each year at the market. These posters are also available at Queen Anne Frame. We have had the privilege of working with three artists over the past 9 years and are currently working with Frida Clements, who has just created the second poster in her series of four. Take a look below to see all the posters. We're so excited to reveal our 2018 season poster. This is the second in the series by the incredible Frida Clements. This year, Frida utilized a combination of watercolor along with hand-drawn line art to create a visually stunning poster that also conveys the mission and vision of QAFM. Frida Clements is a PNW illustrator whose intricate line drawings and nature-inspired palette complement her distinctive Scandinavian aesthetic, in which flora and fauna are frequent subjects. She has had a long history of illustrating music posters for touring bands, and was named “Best Show Poster Artist” in 2010 by Seattle Weekly, along with having her music posters featured in the books "1000 Indie Posters", "Gig Posters Volume II" and "The Paper & Ink Workshop." Stay tuned! Frida will be signing posters this season at QAFM. We are thrilled with the first in the series of 4 by the extremely talented Frida Clements. We are in love with this new take on the QAFM poster and believe that it fully conveys our 2017 theme of Growing Together. He’s done it again! In the final poster of the series by Joe Wirtheim. 2016’s poster focused on our community gathering together at the table, sharing food and enjoying the market. Since QAFM is such a dynamic place to be every Thursday, Joe included our wonderful chickens to portray the fun that we have at market. We would love for you to “gather” with us this season at QAFM, and we are so thankful to Joe for again creating such a fabulous poster for us. Check out Joe’s beautiful website to see his work for other organizations that promote community building. 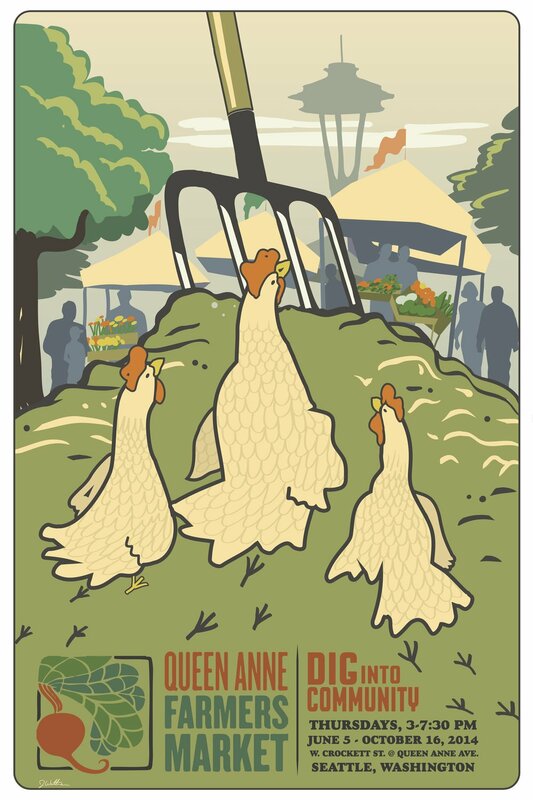 For the third year running, Joe Wirtheim created Queen Anne Farmers Market's collectable poster, setting the stage for a great new season with his humorous take on our community-run urban market. The poster invited you to gather your friends, whether they are human, bovine or just silly chickens, and join the fun at the top of the hill. Joe once again gave the neighborhood a call to action in his beautiful poster for the 2014 season. Three neighborhood chickens heed the call to “Dig Into Community” by climbing Queen Anne Hill to join the farmers market fun. Won’t you join us too? Joe’s work has been featured on the cover of Organic Gardening magazine and in the pages of Martha Stewart and other publications. We feel fortunate to have him lend his talent and community-minded vision to our poster series. We are proud to introduce QAFM’s poster for 2013 created by a very talented Pacific Northwest graphic designer, Joe Wirtheim. We first met Joe at the Fremont Market where he introduced his “Victory Garden of Tomorrow” poster series to Seattle. Joe’s work is as inspiring as it is beautiful with a message of meaningful change behind his dynamic and vibrant illustrations, “I’d like to spread the vision of a future that is sustainable and dynamic, while staying connected to our legacy of ingenuity, invention and diverse community,” he said. For QAFM’s poster, Joe chose to highlight the market experience from a child’s perspective, while inviting viewers to join in the fun, “Everybody’s at the Queen Anne Farmers Market.” Thanks to Joe, we’re inspired to believe that everybody will indeed join us every Thursday to celebrate great local food and build community. We owe a debt of gratitude to graphic designer, Elizabeth Mullaly. Her beautiful artistry and gorgeous use of color elevated a simple poster series into the realm of true art. Elizabeth’s posters are favored by collectors throughout Seattle and beyond. Whether it’s the apples in autumnal hues or bright beets, Elizabeth managed to capture the lush abundance of Washington’s farm produce beautifully. Thank you, Elizabeth! Wanna join our mailing list to keep up to date on all the market happenings? You’re all signed up! Stay tuned for updates from the Queen Anne Farmers Market.